Established 1869. President, Charles Parker; Secretary and Treasurer, Dexter W. Parker; Manufacturers of Shade Cloths, Shade Rollers (Patent Central Bore) and Shade Fringes. 440 Broad St."
Charles Parker, President; C. E. Parker , Vice-President; W. H. Lyon, Secretary. Manufacturers of The Parker Lamps, Chandeliers, Library and Parlor Lamps, Artistic Brass and Bronze Goods, Coffee and Spice Mills, Vises, Blinds, Hinges, etc. New York Office, 97 Chambers Street." "PARKER & WHIPPLE CO. Clock Manufacturers." 1837 - patent - mill for grinding bark, corn, etc. Charles Parker. (25 November 1837). Letters patent no. 484: Mill for grinding bark, corn, etc. (Viewed 29 April 2018. AAA02687). Online - Google Patents. (See pdf). Online - Courtesy Harvard University. C. W. van Vliet, assignor to Charles Parker. (20 November 1855). Letters patent no. 13,837: Mill for grinding coffee. (Viewed 17 March 2018. AAA001256). William Mix, assignor to Charles Parker. (4 August 1857). Reissue no. 480; original letters patent no. 6413 (1 May 1849): Improved method of making wire-strengthened spoons. (Viewed 29 April 2018. AAA02694). Connecticut Historical Society, Hartford, call no. 683 C477p, 1862. Online - Courtesy University of California library. Chauncey Buckley, assignor to Charles Parker. (26 December 1865). Letters patent no. 51,776: Improvement in manufacture of lenses for spectacles. (Viewed 29 April 2018. AAA02693). Russell B. Perkins, assignor to himself and Charles Parker. (29 May 1866). Reissue no. 2258; original letters patent no. 34,864 (1 April 1862): Improvement in the manufacture of spoons. (Viewed 29 April 2018. AAA02692). Chauncey Buckley, assignor to Charles Parker. (25 June 1867). Letters patent no. 65,998: Improvement in machines for forming spectacle-frames. (Viewed 28 April 2018. AAA02667). Online - Courtesy of University of Michigan. Hiram Richmond, assignor to Charles Parker. (6 October 1868). Letters patent no. 82,752: Match-safe. (Viewed 27 April 2018. AAA02597). George N. Cummings, assignor to Charles Parker. (31 March 1868). Reissue no. 2908; original letters patent no. 67,176 [sic, 67,167] (30 July 1867): Improvement in eye-glasses. (Viewed 29 April 2018. AAA02690). Charles Parker and Edmund Parker, assignors to Charles Parker. (5 May 1868). Letters patent no. 77,649: Improvement in coffee-mills. (Viewed 29 April 2018. AAA02691). Metropolitan Museum of Art, New York, accession no. 58.632. (4 March 1869). New England news; Connecticut [with "New Haven County" section and mention of Wilcox Silver Plate Company and Parker & Casper]. Hartford Courant, p. 4. (Viewed 21 October 2018. D00409). Charles Parker. (6 April 1869). Design no. 3443: Design for a tobacco box. (Viewed 29 April 2018. AAA02689). Hiram Richmond, assignor to Charles Parker. (14 September 1869). Letters patent no. 94,775: Improvements in match-safes. (Viewed 27 April 2018. AAA02598). Charles Parker. (21 September 1869). Letters patent no. 95,131: Improved cracker and grinding-mill. (Viewed 27 April 2018. AAA02599). Metropolitan Museum of Art, New York, accession no. 1970.569.1. Click the following link to see the parallel webpage - Charles Parker Company (household items) in collections, at auction, and in exhibitions. Online - Courtesy University of California Libaries. Chauncey Buckley, assignor to Charles Parker. (12 April 1870). Letters patent no. 101,820: Improvement in spectacles-frames. (Viewed 22 March 2018. AAA01439). George Geer, assignor to (3 May 1870). Letters patent no. 102,676: Match-safe. (Viewed 22 March 2018. AAA01441). Bennet Jerald, assignor to Charles Parker. (7 June 1870). Design no. 4096: Design for spoons. (Viewed 29 April 2018. AAA02685). Thomas W. Brown, assignor to Charles Parker. (19 July 1870). Letters patent no. 105,545: Improved coffee-mill. (Viewed 29 April 2018. AAA02686). Edward S. Boynton, assignor to himself and Charles Parker. (9 August 1870). Letters patent no. 106,251: Improvement in process of forming vaccuum in freezing apparatus. (Viewed 22 March 2018. AAA01440). Thomas W. Brown, assignor to Charles Parker. (27 September 1870). Reissue no. 4130; original letters patent no. 105,545 (19 July 1870): Improvement in coffee-mills. (Viewed 29 April 2018. AAA02688). Pietro Cinquini, assignor to Charles Parker. (9 May 1871). Design no. 4874: Design for counter weighing-scales. (Viewed 29 April 2018. AAA02684). George M. Hubbard, assignor to Parker & Whipple Company. (31 October 1871). Letters patent no. 120,441: Improvements in fasteners for meeting-rails of sashes. (Viewed 16 March 2018. AAA01214). George M. Hubbard, assignor to Parker & Whipple. (13 February 1872). Letters patent no. 123,699: Improvement in clothes-hooks. (Viewed 16 March 2018. AAA01215). Chauncey Buckley, assignor to Charles Parker. (15 October 1872). Letters patent no. 132,246: Improvement in spectacle-cases. (Viewed 27 April 2018. AAA02601). Charles S. Jennings, assignor to Parker & Whipple Company. (8 April 1873; filed 21 March 1873). Letters patent no. 137,685: Improvement in reversible knob-latches. (Viewed 22 March 2018. AAA01444). Pritzker Military Museum and Library, Chicago, call no. TS536 .P38 1998. Chauncey Buckley, assignor to Charles Parker. (3 February 1874; filed 7 January 1874). Letters patent no. 147,098: Improvement in catches for match-boxes. (Viewed 16 March 2018. AAA01216). Chauncey Buckley, assignor to Meriden Curtain-Fixture Company. (3 March 1974; filed 15 January 1874). Letters patent no. 148,174: Improvement in game-tables. (Viewed 27 April 2018. AAA02600). August W. Hirschfeld, assignor to Parker & Whipple. (1 September 1874; filed 20 July 1874). Design no. 7737: Design for fire-shovel. (Viewed 29 April 2018. AAA02697). Cornelius Coleman, assignor to Parker & Whipple Company. (11 October 1875; filed 28 September 1875). Letters patent no. 168,721: Improvement in door-bells. (Viewed 29 March 2018. AAA01620). Cornelius Coleman, assignor to Parker & Whipple. (2 November 1875; filed 28 September 1875). Letters patent no. 169,421: Improvement in attaching knobs to spindles. (Viewed 29 March 2018. AAA01621). Online - Courtesy The Library of Congress, Washington, DC. Online - Courtesy University of Connecticut Libraries, Storrs. Otis J. Range, assignor to Charles Parker. (4 April 1876; filed 9 March 1876). Letters patent no. 175,753: Improvement in coffee-mills. (Viewed 29 April 2018. AAA02683). Pietro Cinquini, assignor to Charles Parker. (4 April 1876; filed 16 March 1876). Design no. 9189: Design for coffee-mills covers. (Viewed 26 April 2018. AAA02618). Dexter W. Parker, assignor to Charles Parker. (27 February 1877; filed 22 November 1876). Letters patent no. 187,898: Improvement in coffee-mills. (Viewed 22 March 2018. AAA01433). James M. Perkins, assignor to Charles Parker Company. (16 December 1879; filed 12 June 1878). Letters patent no. 222,729: Improvement in the manufacture of spoons. (Viewed 29 April 2018. AAA02681). Connecticut Historical Society, Hartford, call no. 683 C477p, 1880. Charles Parker Company. (3 March 1880). Advertisement: "Gold Steel or Plated Spectacles..." Meriden Daily Republican, p. 1, column 1. (Viewed 10 September 2017. G00255). Chauncey Buckley, assignor to Charles Parker Company. (8 June 1880; filed 27 October 1879). Letters patent no. 228,598: Match-box. (Viewed 22 March 2018. AAA01445). Francis Hickman, assignor to Charles Parker Company. (20 July 1880; filed 26 October 1878). Letters patent no. 230,279: Coffee-mill. (Viewed 26 April 2018. AAA02602). Charles S. Jennings, assignor to Parker & Whipple. (17 August 1880; filed 22 May 1880). Letters patent no. 231,171: Reversible latch. (Viewed 29 April 2018. AAA02696). Lewis F. Griswold, assignor to Charles Parker Company. (24 August 1880; filed 19 June 1880). Design no. 11,956: Design for spoon and fork. (Viewed 27 April 2018. AAA02616). Lewis F. Griswold, assignor to . (31 August 1880; filed 27 July 1880). Design no. 11,961: Design for spoons and forks. (Viewed 27 April 2018. AAA02617). Dexter W. Parker and Frank H. Chapman, assignors to Charles Parker Company. (5 October 1880; filed 29 April 1880). Letters patent no. 233,010: Domestic grinding-mill. (Viewed 26 April 2018. AAA02603). Online - Winterthur Museum, Delaware. (23 September 1881). The State Fair [with mention: "... Diplomas were awarded to the following named for articles manufactured or displayed by them ... Charles Parker, 2d, carpets... " (at this juncture, others articles show that Charles Parker Co. exhibited vises and guns, but do not mention carpets)]. Meriden Daily Republican, pp. 1-2. (Viewed 29 September 2018. B00570-72). (20 December 1882). State news [including mention: "... the Charles Parker company [pays taxes on] $214,310... " Morning Journal and Courier (New Haven, CT), presumably p. 4, col. 3. (Viewed 29 September 2018. B00584). Frank H. Chapman, assignor to Charles Parker Company. (7 February 1882; filed 14 December 1881). Letters patent no. 253,264: Coffee-mill. (Viewed 29 April 2018. AAA02680). Dexter W. Parker. (12 December 1882; filed 8 November 1882). Letters patent no. 269,105: Extension lamp-fixture. (Viewed 27 April 2018. AAA02619). Lewis F. Griswold, assignor to Chas. Parker Company. (26 December 1882; filed 16 November 1882). Letters patent no. 269,783: Shade-ring clamp. (Viewed 27 April 2018. AAA02608). (4 October 1883). Court notes [with mention of Parker & Whipple vs. Yale Clock company]. Morning Journal and Courier (New Haven, CT), presumably p. 4, col. 3. (Viewed 10 October 2018. B00909). Charles Parker Company. (15 February 1883). Advertisement: "The Charles Parker Co., Meriden, Conn, Manufacturers of Cabinet Locks... Vises... Plated Spoons". Meriden Daily Republican, p. 1, column 7. (Viewed 10 September 2017. G00256). Charles Parker Company. (13 November 1883). Advertisement: "The Charles Parker Co., Meriden, Conn., Manufacturers of Cabinet Locks... Vises... Plated Spoons and Forks..." Meriden Daily Republican, p. 1, column 8. (Viewed 10 September 2017. G00264). Augustus H. Jones, assignor to Charles Parker Company. (30 January 1883; filed 12 December 1882). Letters patent no. 271,334: Extension lamp-fixture. (Viewed 13 April 2018. AAA02297). Frank H. Chapman, assignor to Chas. Parker Company. (30 January 1883; filed 7 December 1882). Letters patent no. 271,420: Extension-chandelier. (Viewed 13 April 2018. AAA02298). Otis J. Range, assignor to Charles Parker Company. (20 February 1883; filed 18 November 1882). Letters patent no. 272,584: Coffee-mill. (Viewed 27 April 2018. AAA02620). Ralph A. Wooding, assignor to Charles Parker Company. (6 March 1883; filed 27 January 1883). Letters patent no. 273,420: Shade-ring clamp. (Viewed 13 April 2018. AAA02299). Dexter W. Parker. (10 April 1883; filed 29 December 1882). Letters patent no. 275,515: Extension-chandelier. (Viewed 27 April 2018. AAA02621). Lewis F. Griswold and Ralph A. Wooding, assignors to Charles Parker Company. (17 April 1883; filed 8 March 1883). Letters patent no. 276,030: Clamp for lamp-shades. (Viewed 13 April 2018. AAA02300). Dexter W. Parker. (8 May 1883; filed 2 March 1883). Letters patent no. 277,057: Extension-chandelier. (Viewed 27 April 2018. AAA02622). Dexter W. Parker. (29 May 1883; filed 13 March 1883). Letters patent no. 278,359: Extension-chandelier. (Viewed 27 April 2018. AAA02623). Dexter W. Parker. (5 June 1883; filed 24 November 1882). Letters patent no. 278,729: Lamp-support. (Viewed 27 April 2018. AAA02624). Lewis F. Griswold, assignor to Charles Parker Company. (5 June 1883; filed 23 April 1883). Design no. 13,968: Design for a weight for extension-lamps. (Viewed 27 April 2018. AAA02625). Frank H. Chapman, assignor to Charles Parker Company. (12 June 1883; filed 26 February 1883). Letters patent no. 279,130: Coffee-mill. (Viewed 25 April 2018. AAA02551). William G. Leonard, assignor to Charles Parker Company. (17 July 1883; filed 18 May 1883). Letters patent no. 281,531: lamp-fount. (Viewed 13 April 2018. AAA02301). Ralph A. Wooding, assignor to Charles Parker Company. (17 July 1883; filed 29 May 1883). Letters patent no. 281,656: Extension-fixture for chandeliers. (Viewed 25 April 2018. AAA02552). Dexter W. Parker and Lewis F. Griswold, assignor to Charles Parker Company. (24 July 1883; filed 26 April 1883). Letters patent no. 282,028: Extension lamp-fixture. (Viewed 25 April 2018. AAA02553). Lewis F. Griswold and Frank H. Chapman, assignor to Charles Parker Company. (7 August 1883; filed 8 June 1883). Letters patent no. 282,628: Extension-fixture for chandeliers. (Viewed 25 April 2018. AAA02554). Dexter W. Parker and Lewis F. Griswold, assignor to Charles Parker Company. (18 September 1883; filed 14 June 1883). Letters patent no. 285,063: Extension library-lamp. (Viewed 25 April 2018. AAA02555). Online - Courtesy Yale University library, New Haven. (9 September 1884). The court record [with mention: "The Bradley & Hubbard Mfg. Co. v. The Charles Parker Co."] Morning Journal and Courier (New Haven, CT), presumably p. 4, col. 3. (Viewed 7 October 2018. B00816). Dexter W. Parker and Lewis F. Griswold, assignors to Charles Parker Company. (22 April 1884; filed 16 October 1883). Letters patent no. 297,157: Extension-lamp. (Viewed 27 April 2018. AAA02609). Frank H. Chapman and Ralph A. Wooding, assignors to Charles Parker Company. (15 July 1884; filed 29 June 1883). Letters patent no. 301,861: Extension-tube for lamps and chandeliers. (Viewed 27 April 2018. AAA02610). Lewis F. Griswold, assignor to Charles Parker Company. (23 December 1884; filed 12 April 1884). Letters patent no. 309,539: Hall-lamp. (Viewed 27 April 2018. AAA02611). Dexter W. Parker and Lewis F. Griswold, assignors to Charles Parker Company. (23 December 1884; filed 24 June 1884). Design no. 15,640: Design for a lamp-harp. (Viewed 27 April 2018. AAA02626). Frank H. Chapman, assignor to Charles Parker Company. (30 December 1884; filed 20 March 1884). Letters patent no. 309,818: Chandelier. (Viewed 27 April 2018. AAA02612). Lewis F. Griswold, assignor to Charles Parker Company. (30 December 1884; filed 30 June 1884). Letters patent no. 310,050: Extension-lamp fixture. (Viewed 27 April 2018. AAA02613). Dexter W. Parker. (3 February 1885; filed 5 April 1884). Letters patent no. 311,519: Suspension device for lamp-shades. (Viewed 27 April 2018. AAA02627). Dexter W. Parker and Lewis F. Griswold, assignor to Charles Parker Company. (3 February 1885; filed 14 April 1884). Letters patent no. 311,520: Extension-lamp. (Viewed 17 March 2018. AAA01251). John L. Rutherford and Allen F. Wood, assignors to Parker & Whipple Company. (19 May 1885; filed 1 October 1883). Letters patent no. 318,435: Clock-case. (Viewed 27 April 2018. AAA02615). Charles Parker Company. (4 February 1886). Advertisement: "The Charles Parker Co., Meriden, Conn., Manufacturers of Cabinet Locks... Vises... Plated Spoons And Forks..." Meriden Daily Republican, p. 1, column 8. (Viewed 9 September 2017. G00230). Dexter W. Parker, assignor to Chas. Parker Company. (23 February 1886; filed 23 November 1885). Letters patent no. 336,738; serial no. 183,590: Extension-lamp. (Viewed 17 March 2018. AAA01254). Dexter W. Parker, assignor to Charles Parker Company. (6 April 1886; filed 2 March 1885). Letters patent no. 339,205; serial no. 157,518: Extension lamp-fixture. (Viewed 17 March 2018. AAA01255). Frank M. Wright and Warren M. Wood, assignors to Parker & Whipple. (14 September 1886; filed 19 February 1886). Letters patent no. 349,025; serial no. 192,525: Calendar-clock. (Viewed 16 March 2018. AAA01213). (21 October 1887). The court record [with mention of Parker & Whipple Company et al. vs. Yale Clock Company]. National Republican (Washington, DC), presumably p. 3, col. 3. (Viewed 10 October 2018. B00910). Dexter W. Parker. (9 August 1887; filed 10 July 1886). Letters patent no. 367,840: Parlor extension-lamp. (Viewed 27 April 2018. AAA02614). 1887 - patent - suspension device for lamps, etc. Lewis F. Griswold, assignor to Charles Parker Company. (25 October 1887; filed 8 April 1887). Letters patent no. 372,260; serial no. 234,128: Suspension device for lamps, etc. (Viewed 15 April 2018. AAA02418). (14 April 1888). The court record [with mention "The Bradley & Hubbard Manufacturing company vs. the Charles Parker company..."] Morning Journal and Courier (New Haven, CT), presumably p. 4, col. 3. (Viewed 10 October 2018. B00887). (25 July 1888). The court record [with mention of Bradley & Hubbard Mfg. Co. vs. Charles Parker Co.] Morning Journal and Courier (New Haven, CT), presumably p. 4, col. 2. (Viewed 7 October 2018. A02754). Dexter W. Parker, assignor to Charles Parker Company. (17 April 1888; filed 8 December 1885). Letters patent no. 381,275: Lamp-fixture. (Viewed 22 March 2018. AAA01442). Dexter W. Parker and Lewis F. Griswold, assignors to Charles Parker Company. (8 May 1888; filed 19 July 1886). Letters patent no. 382,661; serial no. 208,396: Process of ornamenting metallic surfaces. (Viewed 27 April 2018. AAA02607). William W. Kilborn, assignor to Charles Parker Company. (29 May 1888; filed 30 November 1887). Letters patent no. 383,815; serial no. 256,496: Locking device in extension-chandeliers. (Viewed 22 March 2018. AAA01443). (1889). Meriden Journal Souvenir [leather-bound booklet containing a list of the manufactories contributing to the exhibition at the Delavan Opera House, Meriden, 10 October 1889, and other companies in Meriden], 4 pp. (Viewed 13 September 2018. L00763; L00765-68). Online - citation - description of booklet by publisher - (10 October 1889). Meriden Journal Souvenir. Meriden Daily Journal, p. 4. Also see: Online - (10 October 1889). Meriden industries: The complete list from the Journal’s Souvenir of the visit. Meriden Daily Journal, p. 1, col. 6. (10 October 1889). Americans in Meriden: Visit of the International American Congress [including section on Charles Parker Co. exhibited wares]. Meriden Daily Republican, pp. 1-2. (Viewed 9 September 2018. L00751-59). (10 October 1889). Our guests: Honored visitors here to-day [including section describing exhibited Charles Parker Company wares including "a line of brass goods, including a lounge, a chair and a complete line of table and piano lamps", coffee mills and spoons]. Meriden Daily Journal, p. 1. (Viewed 15 September 2018. L00769-83). (11 October 1889). Compliments for Meriden: What outsiders say about her enterprise [with excerpts from Hartford Courant, New Haven Register, New York Herald, and New York Tribune. No specific Charles Parker Co. mention]. Meriden Daily Republican, p. 1. (Viewed 9 September 2018. L00747-50). (11 October 1889). The show photographed: Fine pictures of the Opera House exhibit made. ["The best of them will be forwarded to Frank Leslie’s paper— what the state and New York press has to say about Meriden", with excerpts from Hartford Courant, Hartford Times, New Haven Register, New York Herald, New York Tribune, Waterbury Republican, with no specific mention of Charles Parker Co.] Meriden Daily Journal, p. 1. (Viewed 14 September 2018. L00785-89). 1889 - patent - extension-fixture for lamps, etc. Lewis F. Griswold, assignor to Charles Parker Company. (16 April 1889; filed 13 September 1888). Letters patent no. 401,347; serial no. 285,286: Extension-fixture for lamps, etc. (Viewed 15 April 2018. AAA02419). Dexter W. Parker, assignor to Charles Parker Company. (16 April 1889; filed 24 April 1888). Letters patent no. 401,583; serial no. 271,712: Lamp. (Viewed 15 April 2018. AAA02420). Lewis F. Griswold, assignor to Charles Parker Company. (23 April 1889; filed 13 September 1888). Letters patent no. 402,077; serial no. 285,287: Chandelier. (Viewed 15 April 2018. AAA02421). Lewis F. Griswold, assignor to Charles Parker Company. (29 October 1889; filed 9 May 1889). Letters patent no. 413,780; serial no. 310,119: Suspension device for hanging lamps. (Viewed 15 April 2018. AAA02422). Lewis F. Griswold, assignor to Charles Parker Company. (4 February 1890; filed 31 May 1889). Letters patent no. 420,875; serial no. 312,737: Extension device for lamp-fixtures. (Viewed 22 March 2018. AAA01435). 1890 - patent - extension-fixture for lamps, etc. Lewis F. Griswold, assignor to Charles Parker Company. (18 March 1890; filed 13 July 1889). Reissued letters patent no. 11,067; serial no. 317,471; original letters patent no. 401,347 (16 April 1889): Extension-fixture for lamps, etc. (Viewed 29 April 2018. AAA02668). Dexter W. Parker, assignor to Charles Parker Company. (22 April 1890; filed 29 January 1890). Letters patent no. 426,309; serial no. 338,501: Cigar-box. (Viewed 22 March 2018. AAA01436). Lewis F. Griswold, assignor to Charles Parker Company. (1 July 1890; filed 4 March 1890). Letters patent no. 431,459; serial no. 342,630: Stop-hinge. (Viewed 22 March 2018. AAA01437). Lewis F. Griswold, assignor to Charles Parker Company. (11 November 1890; filed 10 July 1889). Letters patent no. 440,428; serial no. 317,069: Spring-roller. (Viewed 27 April 2018. AAA02628). Online - Courtesy University of Connecticut Libraries. Charles Parker Company. (2 January 1891). Advertisement: "The Charles Parker Co., Meriden, Conn., Manufacturer of Cabinet Locks... Vises... Spoons and Forks..." Meriden Daily Republican 2 January 1891, p. 4, column 2. (Viewed 11 September 2017. G00221). Online - Courtesy Metropolitan Museum of Art, New York (6 April 1892, p. 4; 13 April 1892, p. 12). Judson C. Perkins, assignor to Meriden Curtain Fixture Company. (30 August 1892; filed 13 January 1892). Letters patent no. 481,733; serial no. 417,935: Spring shade-roller. (Viewed 27 April 2018. AAA02629). Judson C. Perkins and Lewis E. Leigh, assignors to Meriden Curtain Fixture Company. (13 September 1892; filed 13 January 1892). Letters patent no. 482,563; serial no. 417,918: Sprindle-tip for spring shade-rollers. (Viewed 27 April 2018. AAA02630). Lewis F. Griswold, assignor to Charles Parker Company. (8 November 1892; filed 1 September 1891). Letters patent no. 486,038; serial no. 404,394: Lamp. (Viewed 27 April 2018. AAA02606). Online - Courtesy North Central College, Naperville, IL. Online - University of California Libraries. Online - (building illustration) Courtesy University of Connecticut, Storrs. Benjamin Arnold, assignor to Meriden Curtain Fixture Company. (5 September 1893; filed 22 December 1892). Letters patent no. 504,316; serial no. 456,020: Machine for making and knotting fringes. (Viewed 27 April 2018. AAA02605). Online - Courtesy Allen County Public Library, Fort Wayne, IN. Online - Courtesy New York Public Library. Online - Courtesy University of Minnesota library. Online - Courtesy University of Minnesota library (25 October 1894, p. 41; 10 November 1894, p. 58; 25 November 1894, p. 58; 10 December 1894, p. 58; 25 December 1894, p. 70). Online - Courtesy University of California, Berkeley library. For more historical accounts, see Meriden-area history books online. (12 August 1895). Meriden’s factories [including mention of Meriden Curtain Fixture Company as the 4th largest factory in Meriden; Charles Parker Company as the 6th largest; Charles Parker Spoon shop as the 19th; Parker Clock shop as the 23rd]. The Daily Morning Journal and Courier (New Haven, CT), p. 3, col. 1. (Viewed 27 September 2018. B00517-18). Charles Parker Company. (1 March 1895). Advertisement: "The Charles Parker Co., Meriden, Conn., Manufacturers of Cabinet Locks... Vises... Spoons and Forks..." Meriden Daily Republican, p. 2, column 1. (Viewed 11 September 2017. G00233). Online - Courtesy New York Public Library (September, p. 361; October, p. 401). Online citation - Courtesy New York Public Library. Lewis F. Griswold, assignor to Charles Parker Company. (9 March 1897; filed 31 August 1896). Letters patent no. 578,560; serial no. 604,414: Portable coffee-mill. (Viewed 27 April 2018. AAA02631). Lewis F. Griswold, assignor to Charles Parker Company. (6 July 1897; filed 27 May 1896). Letters patent no. 586,028; serial no. 593,241: Central-draft lamp. (Viewed 27 April 2018. AAA02604). Online - Courtesy Brigham Young University-Idaho library, Rexburg, ID. Hagley Museum and Library, Delaware, call no. Trade Cat .P244 1900. Online - Courtesy University of California. Online - Courtesy New York Public Library (January 1903, p. 14; February 1903, p. 92; March 1903, p. 170; April 1903, p. 242; May 1903, p. 316). William D. Harned, assignor to Meriden Curtain Fixture Co. (3 March 1903; filed 14 November 1902). Letters patent no. 721,699; serial no. 131,423: Spring mechanism for shade-rollers. (Viewed 29 April 2018. AAA02669). William H. Lyon, assignor to Charles Parker Co. (4 August 1903; filed 2 September 1902). Letters patent no. 735,540; serial no. 121,812: Device for attaching window-shades to rollers. (Viewed 27 April 2018. AAA02633). Online - Courtesy University of Michigan (July 1904, p. 156; August 1904, p. 336; September 1904, p. 516; October 1904, p. 696; November 1904, p. 876; December 1904, p. 949). William D. Harned, assignor to Meriden Curtain Fixture Company. (17 May 1904; filed 9 May 1903). Letters patent no. 759,883; serial no 156,326: Spring mechanism for shade-rollers. (Viewed 29 April 2018. AAA02670). Amos M. Doolittle, assignor to Meriden Curtain Fixture Co. (27 December 1904; filed 14 November 1902). Letters patent no. 778,571; serial no. 131,436: Pawl machanism for spring shade-rollers. (Viewed 29 April 2018. AAA02671). Lewis F. Griswold, assignor to Charles Parker Company. (4 July 1905; filed 27 May 1904). Letters patent no. 793,783; serial no. 210,064: Article of wire furniture. (Viewed 27 April 2018. AAA02632). Online - Courtesy Allen County Public Library, Ft. Wayne, IN. Online - Google News (placement 1; 2). Henry Wachtelhausen, assignor to Parker Clock Company. (25 April 1911; filed 15 December 1910). Letters patent no. 990,465; serial no. 597,411: Alarm-clock. (Viewed 29 April 2018. AAA02672). Eli M. Walker, assignor to Charles Parker Company. (1 August 1911; filed 29 March 1911). Letters patent no. 999,684; serial no. 617,551: Coffee-mill. (Viewed 27 April 2018. AAA02634). Eli M. Walker, assignor to Parker Clock Company. (12 December 1911; filed 1 June 1911). Design no. 41,967; serial no. 630,682: Design for an alarm-clock case. (Viewed 27 April 2018. AAA02635). Eli M. Walker, assignor to Parker Clock Company. (3 December 1912; filed 19 June 1912). Design no. 43,331; serial no. 704,687: Design for a clock-case. (Viewed 27 April 2018. AAA02636). Henry W. Wachtelhausen, assignor to Parker Clock Company. (25 November 1913; filed 16 July 1913). Design no. 44,946; serial no. 779,403: Design for an alarm-clock case. (Viewed 29 April 2018. AAA02695). Henry Wachtelhausen, assignor to Parker Clock Company. (14 July 1914; filed 19 June 1912). Letters patent no. 1,103,551; serial no. 704,572: Hair-spring regulator. (Viewed 29 April 2018. AAA02673). Eli M. Walker, assignor to Parker Clock Company. (14 July 1914; filed 19 June 1912). Letters patent no. 1,103,552; serial no. 704,564: Clock. (Viewed 29 April 2018. AAA02674). Henry W. Wachtelhausen, assignor to Parker Clock Company. (9 November 1915; filed 14 May 1915). Letters patent no. 1,1159,437; serial no. 27,988: Spring-motor. (Viewed 28 April 2018. AAA02666). Online - Courtesy Connecticut State Library, Hartford. Thomas J. Conklin, assignor to Charles Parker Company. (4 December 1917; filed 6 February 1917). Letters patent no. 1,248,458; serial no. 146,876: Coffee-mill. (Viewed 29 April 2018. AAA02675). Online - Courtesy Library of Congress, Washington, DC. For more maps, see the historical Meriden maps online. (15 February 1918). Commercial space leased ["Cammann, Voorhees & Floyd, with William H. Whiting & Co., have leased for Ralph M. Ward the store and basement at 25 Murray street to the Charles Parker Company."] The Sun (New York), p. 9, col. 2. (Viewed 13 October 2018. B01002). Hagley Museum and Library, Delaware, call no. Trade Cat .P244 1919. Charles Parker Company bathroom accessories. Montana Historical Society, Helena, call no. PAM 538. Offline - University of California, Santa Barbara. Corning Museum of Glass, Corning, NY, call no. Parker, Charles, Company, Meriden, CT, USA. > Exhibited: Charles Parker Company bathroom cabinets and accessories. Online - exhibition checklist - Museum of Modern Art, New York. See the Charles Parker Company bathroom accessories webpage at artdesigncafe.com. Online - Courtesy of University of Connecticut Libraries, Storrs. Offline - Meriden Public Library, "Meriden - Industries - Glass" file. "Charles Casper and Charles Parker operated a glasscutting shop on Pratt Street, corner of Catlin Street, producing caster bottles, sugar dredgers, mustard and salt linings and other items used with silver fittings by several local silverware manufacturers. The cuttings were usually various styles of flutes and copperwheel engraving. (1969). An exhibition of Connecticut pewter catalogue [c. April - 14 June 1969], 72 pp. 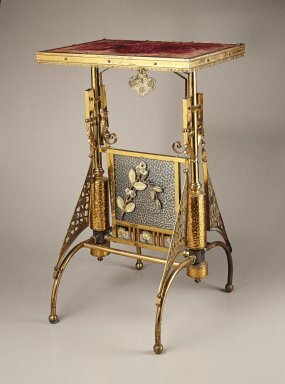 [New Haven, CT: New Haven Colony Historical Society (now New Haven Museum); exhibited design: Charles Parker and Company. (c. 1849). Teapot. (Private lender), pp. 37-8]. (Viewed 14 November 2018. D00560; L00851-54). Yale University library, call. no. Meriden Gravure 976. Also, see exhibition review (with no mention of Parker): Schwartz, Marvin D. (24 May 1969). Antiques: Craftsmanship in Connecticut pewter. New York Times, p. 32. See worldcat.org for locations. Yale University library, New Haven, call no. F104 M5 V85 1988 (LC)+ Oversize. Online - approx. 60 photos from exhibition - Dallas Museum of Art. Online - exhibition information, (Bard College, 2007). See Online - NY Times review: "One of the small, must-see exhibitions this summer", (August 2007). Columbia University, New York, call no. AK2002 Z84. Franco, Janis Leach. (2010). Illustration of Charles Parker (p. 34); photo of Charles Parker mansion, 816 Broad Street, (p. 43). Reprinted in: Meriden. Arcadia Publishing: Charleston, SC. Viewed 15 December 2016. DM. Online - Design Meriden at artdesigncafe.com, 1(1). Offline - press release - Herbert F. Johnson Museum of Art, Cornell University. Offline - exhibition checklist - Herbert F. Johnson Museum of Art, Cornell University. Offline - press release - Crocker Art Museum. Offline - exhibition checklist - Crocker Art Museum. Online - Courtesy Historical New England organization, Boston, MA. "’C’. E. Parker" is not clearly legible in the online copy. "Parker & Casper" later became part of Wilcox Silver Plate Co. See inside front cover of Earl Chapin May’s A century of silver (1847-1947) (1947).